When you are at the poker table or playing blackjack you will have a dealer who is great at shuffling cards and they can make a relatively tough ask look spectacular. Of course, at Lucky Nugget Casino, when you enjoy our fantastic range of table games there is no dealer to watch shuffle the cards. However, that doesn’t mean we don’t appreciate some of the great skills that goes into shuffling the decks. Plus, they could come in handy when you are playing with friends or family at home. So, here is the lowdown on some of the best shuffling techniques. Firstly, whichever technique you decide to use or see being used by the dealer, it’s important that you know the importance of shuffling the deck. As you should know, it’s to randomise the entire deck and ensure that it’s a level playing field when it comes to the games. If players knew or had an idea of what card would follow a certain one, it would ruin the thrill that makes the likes of blackjack and poker the games that they are. We play the games for the unpredictability, and your emotions are based on the unknown, the relief and delight at a win, while the anguish of a loss makes the games so special, and that all stems from shuffling the cards. This ensures every game is honest. Plus, it adds a bit of glamour and fun to proceedings! Some of the tricks the dealers can do are great. This is just the simple, normal shuffle that you will see everyone do. One hand above the other, and split the cards up. It’s easy, and looks fairly simple, but it’ll do the job, so that’s the main thing. This involves holding the deck lightly with two hands and then taking packs from the middle before adding the pile to the palm of your hand. It’s very impressive, and importantly not as difficult as it looks, so don’t be put off! Another that is relatively straightforward to do. Part the cards into two, bring them together by about an inch and then weave them together. If you are practising for the first time, the cards might go everywhere, but you’ll soon get the hang of it! Things are getting more difficult now! For the riffle, you hold half of the deck in each hand, then using your thumbs you release them and they will be weaved together and you straighten them up. However, the downside to the riffle is that your thumbs could often bend the cards. This is a really impressive looking option. That’s because you have to keep the deck on the table, and quickly pull out packs and shuffle the cards. It can be difficult to maintain because of the speed required, but if you pull it off it gives off a really good look. As mentioned, shuffling the deck can be great fun and provide entertainment, and when it comes to that it’s hard to look past some of the magicians out there that do some crazy stuff. Check out this video of the world-renowned Magician Dynamo. Whilst he performs some astounding tricks, the way he shuffles the deck is incredible, almost robotic. We don’t necessarily think you’ll be able to pull off the same skill as him at the next family game of poker. So, there you have it, some of the great techniques when it comes to shuffling the cards. 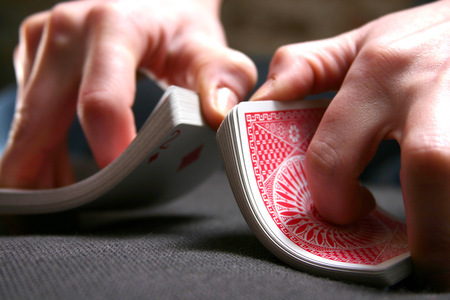 Get a deck out and start practising so that next time you play you can show off more than the overhand shuffle. Or, when you hit the casino you will know what the dealer is dong. Either way, shuffling cards is an essential part to any game, but why not make the start that little bit more glamorous!